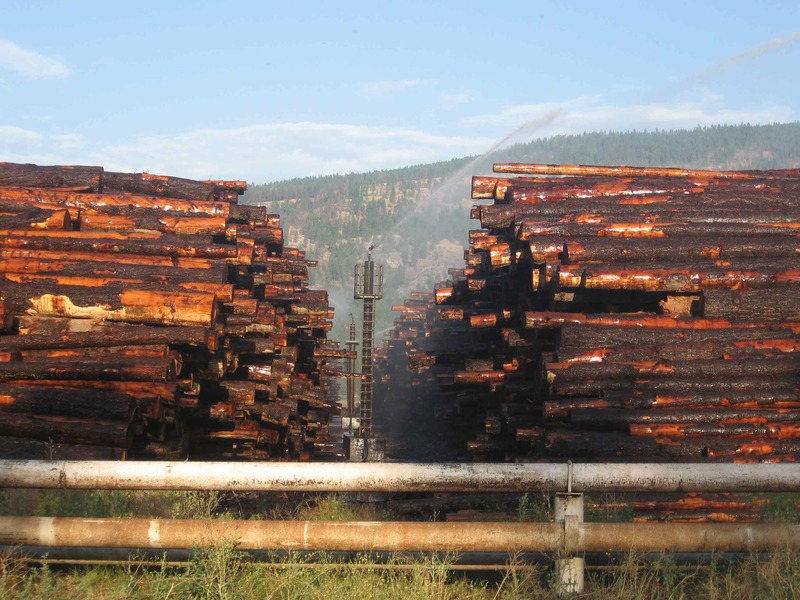 The Kalispel operate a large casino outside of Spokane, but Osterman’s department is self-sustaining from settlement money. “It really is a war for wildlife,” he said. “And land trusts play a critical role. 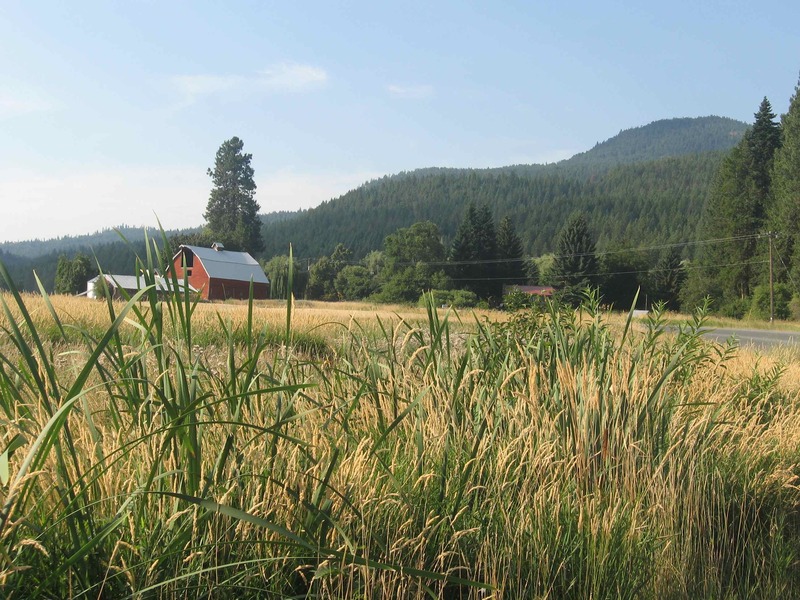 Sometimes we can’t get ourselves in gear fast enough to make a land purchase we want, but they can.” The Tribe is making a major contribution to the Inland Northwest Land Trust to further their partnership. The librarian in Ione warned me that a cold front would come in around midnight, and so it did. There were gusts of wind, light rain, and blessed relief. The dawn came up cloudy with a fresh wind from the south. We had 76 miles to go but it was flat, and without the heat and the climbs of past days it seemed almost easy. If yesterday’s ride was like the Western Adirondacks, today’s ride was a bit like the shoreline of two Adirondack lakes – one that hasn’t been discovered by rich jerks yet, and one that has. 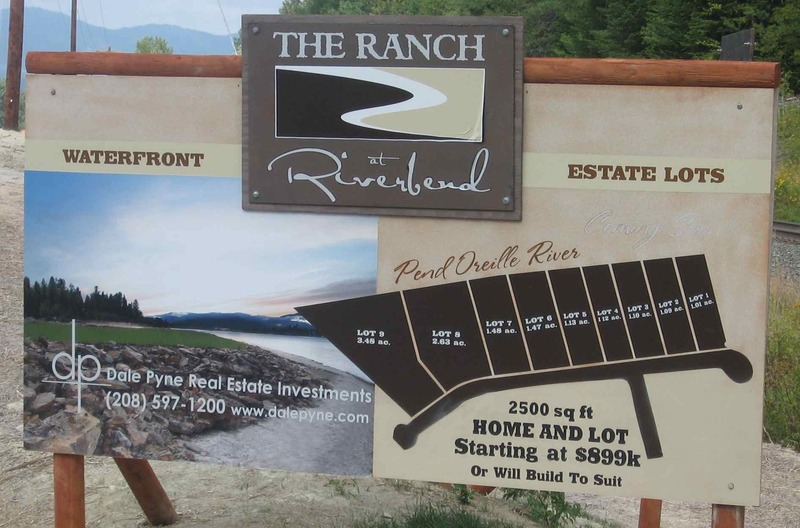 LeClerk Road runs along the east bank of the drowned Pend Oreille River. It feels like a road that would get a lot of traffic on weekends when people are at their lake homes, but on a Tuesday morning it was empty. Herons fished on the shore and raptors watched for their breakfast as we rode past. Our mountain-toned legs ate up the road, and we did 30 miles in the first two hours. The houses were mostly older, small, and tucked away in the vast scenery. Across the river, cars screamed along State Route 20, ignoring it all. Around 9am we entered the Kalispel Indian Reservation. The contrast was dramatic. Where we had been riding past ranchettes and old farms, at the border the land opened up and an open field of 440 acres stretched down to the shore. 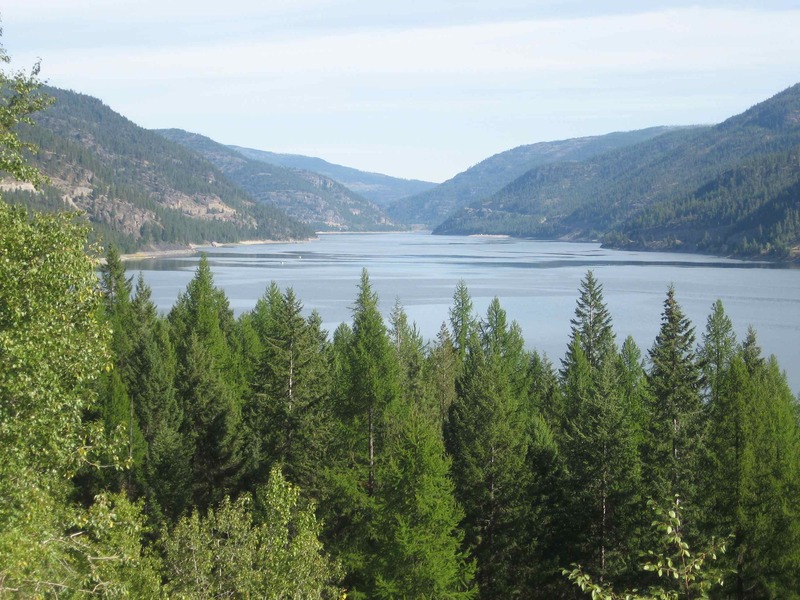 A sign explained that it was a wildlife mitigation project, paid for by the Bonneville Power Authority and managed by the tribe, to compensate for the loss of habitat caused by the construction of Albeni Falls Dam. The tribe is managing the land for geese, mallard, muskrat, deer, eagle, yellow warbler, and black-capped chickadee. 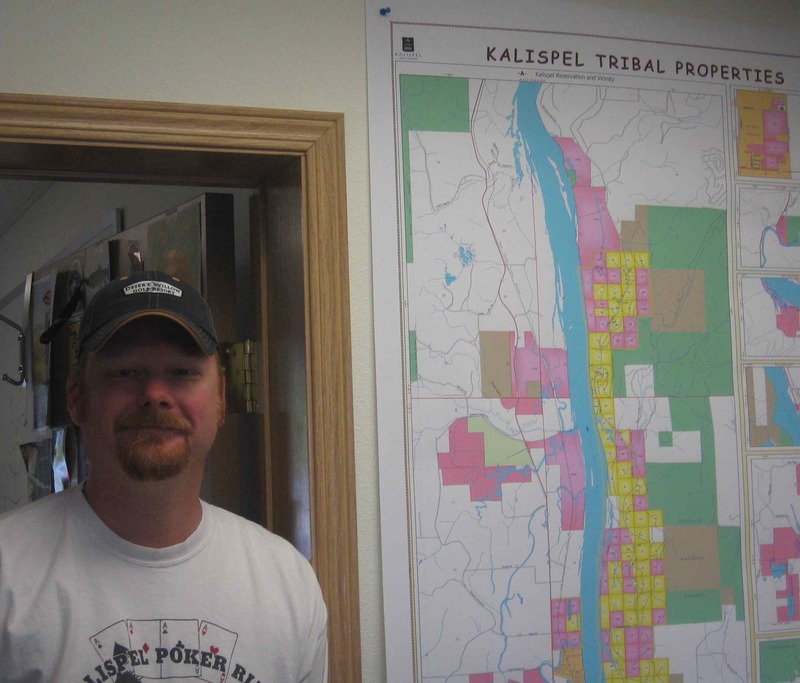 A few miles up the road we got a quick overview of the Kalispel’s ambitious plans for the environmental restoration of their ancestral lands from Deane Osterman, the tribe’s Director of Natural Resources (see separate post). Deane had to run to a tribal council meeting so we pushed on, using the “peloton” technique to compensate for a headwind. A peloton is when riders fan out in a vertical line, like geese, and take turns being in front. The lead rider breaks the wind so the ones behind him can rest. We got our average speed up from 12 miles per hour to 17 miles per hour this way, according to Jim’s handlebar calculator of speed, distance, temperature, and other things. He consults this constantly. I’m glad he does, so I don’t have to. Past the Kalispel lands the ride turned back into cattle and alfalfa farms, with the water in the distance to the right. Deane had explained just how much damage the dams have done to the river, but a tourist wouldn’t know that. It still is beautiful. 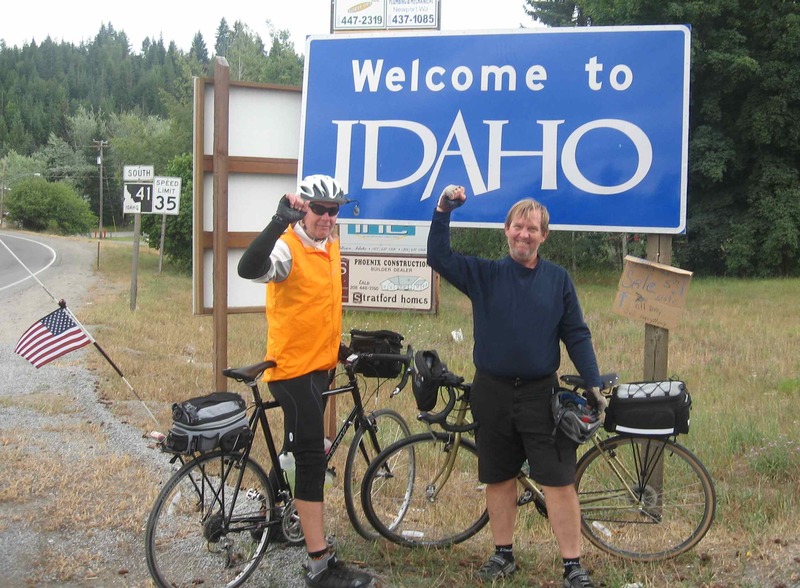 We rode into Newport-Old Town at noon, ate lunch and drank hot coffee at a Safeway supermarket cafe, met up with Sara and Catherine, and after a jolly time we headed into Idaho. Washington had been our route for eight days and about 400 miles, or one-tenth of the entire trip. We crossed the Pend Oreille and rode eastward along its south bank. Once again, the Adventure Cycling folks had clued us into a beautiful rural road that skipped the congested highway. We had 27 miles to go to our destination, Round Lake State Park near Sandpoint. The scenery improved. In fact, it became tremendous. It wouldn’t have surprised me to see Robert Redford waving to us from the roadside. Unfortunately, Californians seem to have discovered the Idaho Panhandle. We saw lots of signs for subdivisions with ridiculous names. One was named “Willow Shores” but was covered with pine trees. What was really depressing was the asking prices. Second-home McMansions, those colossal monuments to bloated ego, seem destined for this place. I hope the housing bust lasts long enough for the locals to organize a land trust. Circular rolls of golden fresh-baled hay were scattered through fields like game pieces. Behind them were stately mountains we didn’t have to climb. 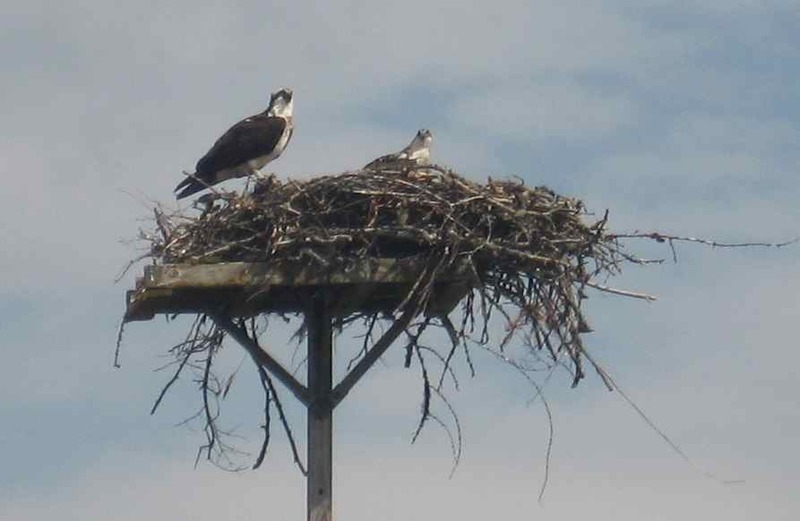 Along one stretch was a series of hacking platforms occupied by nesting pairs of ospreys. This was the longest ride of the trip so far, and for the last few miles the three of us were very tired, but tomorrow is a rest day. Round Lake was cold, the showers were hot, and Sara filled our bellies with bratwurst. 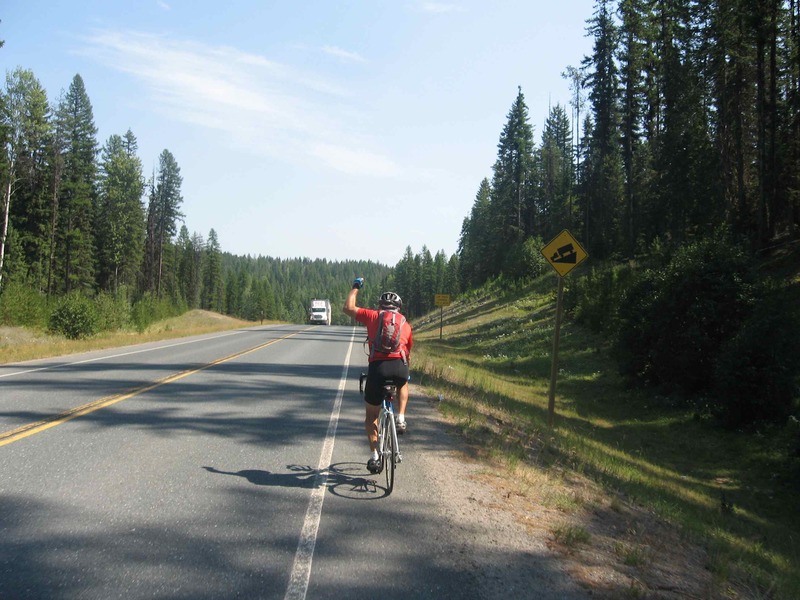 On Day 8 of the ride, we entered Idaho at Old Town, near the junction of State Route 20 and U.S. Route 2. 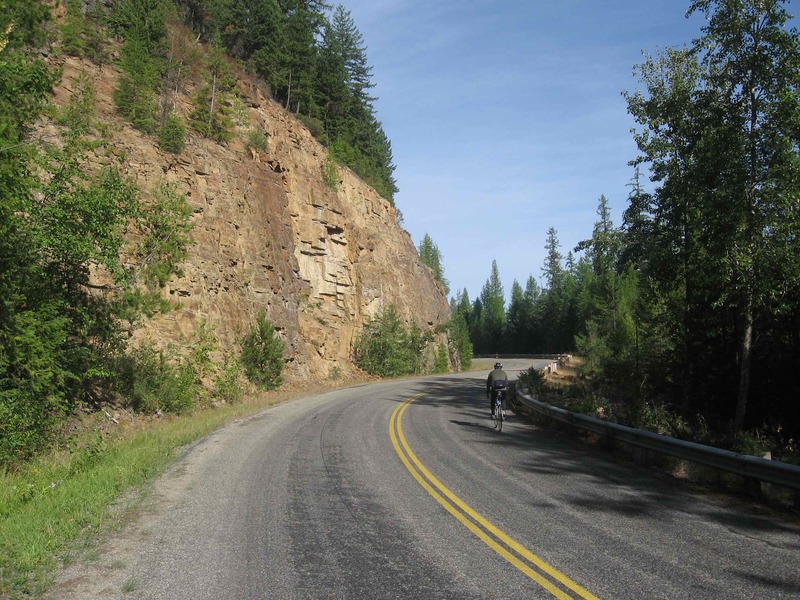 We rode along Old Priest River Road to Round Lake State Park, where we spent the night. 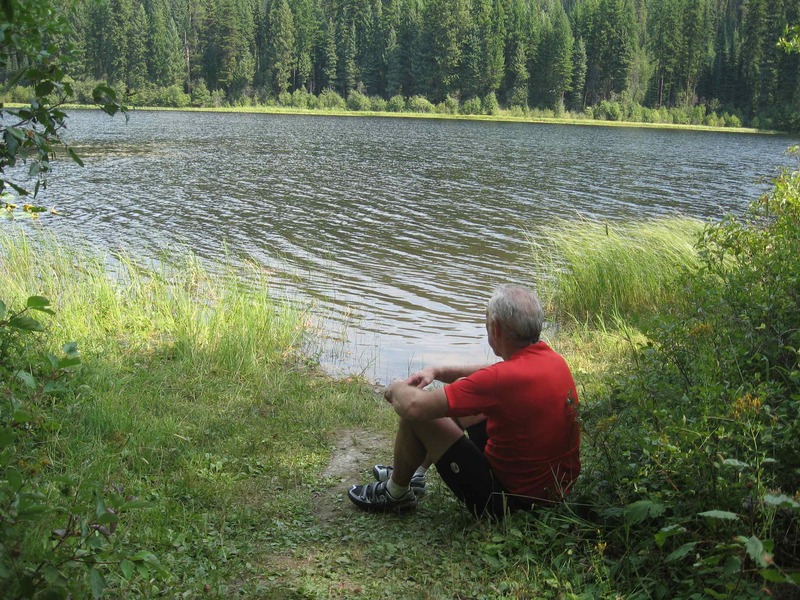 Day 9 was a 15-mile ride into Sandpoint on the shore of Lake Pend Oreille, the source of the Pend Oreille River. Days 10, 11, 12, and 13 were about 70 miles each, and at the end of day 13 we ended up in Glacier National Park. 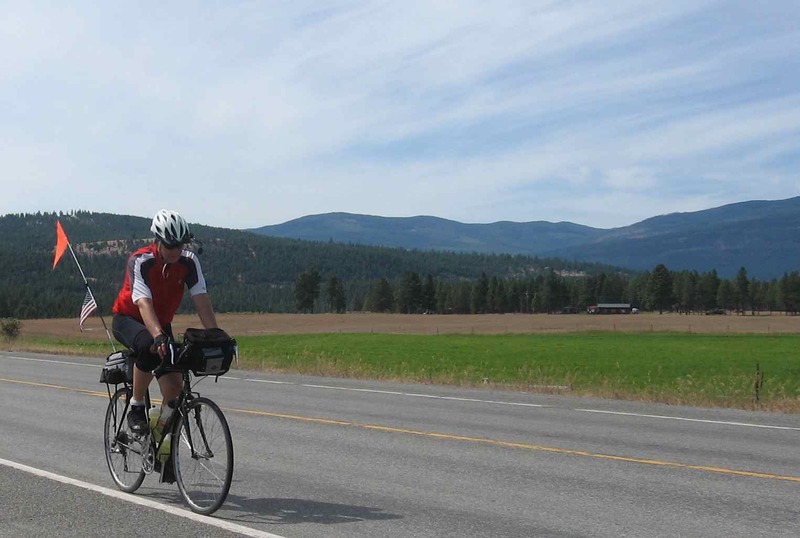 On Day 10 we rode along the Clark Fork River, a major tributary of Lake Pend Oreille, through the towns of Hope and Clark Fork along Route 200. Then we turned north on Route 56 and rode just west of the Cabinet Mountains Wilderness, sleeping in a Forest Service campsite that had no power or cell phone coverage – but which did have rain. On Day 11 we continued north to U.S. Route 2, the major east-west highway up here, and took it eighteen miles to the intersection with Route 37. We turned north there and went along the west shore of Lake Koocanusa, about 40 miles of nothing and quite beautiful. We stayed at another fine Forest Service campground with no electricity or cell phone coverage. On Day 12 we rode 30 miles along the lake shore and then continued north on Route 37 to Eureka, where we spent Saturday night in a city park during rodeo weekend. We all had earplugs. On Sunday (Day 13) we rode south on U.S. Route 93 to Whitefish and Columbia Falls, then on to a campsite on Lake MacDonald in Glacier National Park. We had a rest day in Glacier on Monday (Day 14), Bill and Catherine left the trip at that point. Jim, Sara and I drove back to Columbia Falls. Jim and I mounted our bikes and continued south on Route 83 for a long while. We went along the western slope of the Rockies in Montana, which is some of the wildest territory in the lower 48. 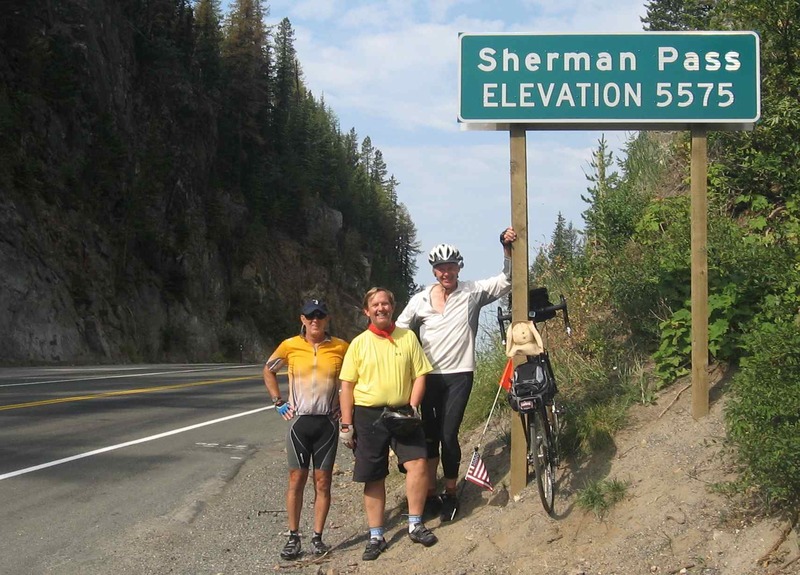 We passed through Bigfork and Seeley Lake in a two day ride marked by more rain, until we hit Route 200 East. 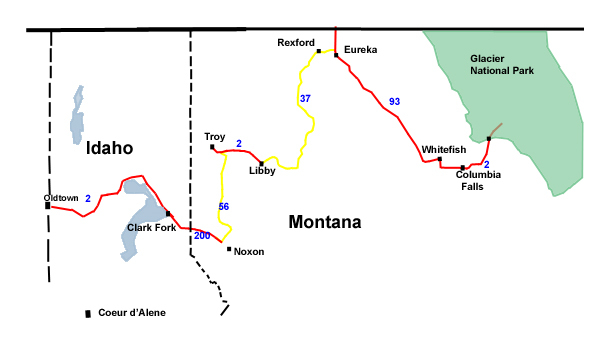 We continued through Ovando and stopped in Lincoln, then headed in a southeasterly direction to Fort Harrison and Helena. 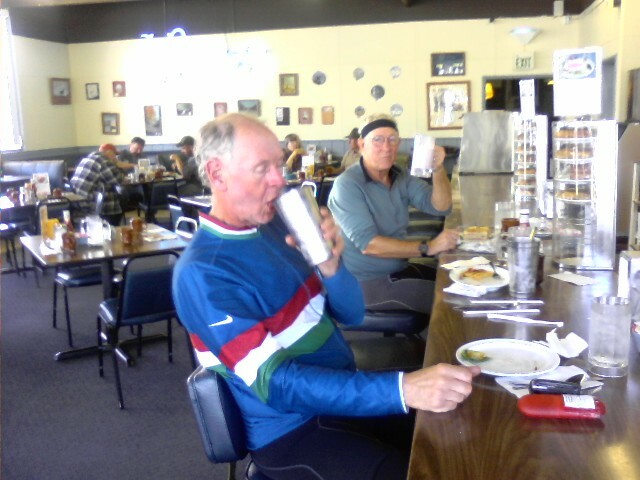 Jim’s brother joined us at the Helena airport and rode with us for the next nine days to Cody, Wyoming. After Helena we took Route 287 adown the east shore of Canyon Ferry Lake to Townsend. Then we crossed the Big Belt Mountains to hit Route 89 south through Ringling and Wilsall. We crossed Interstate 90 at Livingston and continued south on Route 89 to Pray, the site of Chico Hot Springs, where I reunited with my wife Tania. Chico Hot Springs is a short ride north of Yellowstone National Park and the Wyoming border. A Pacific storm wound up during the night and the rain started somewhere in the middle of it. It rained steadily until about 1pm. 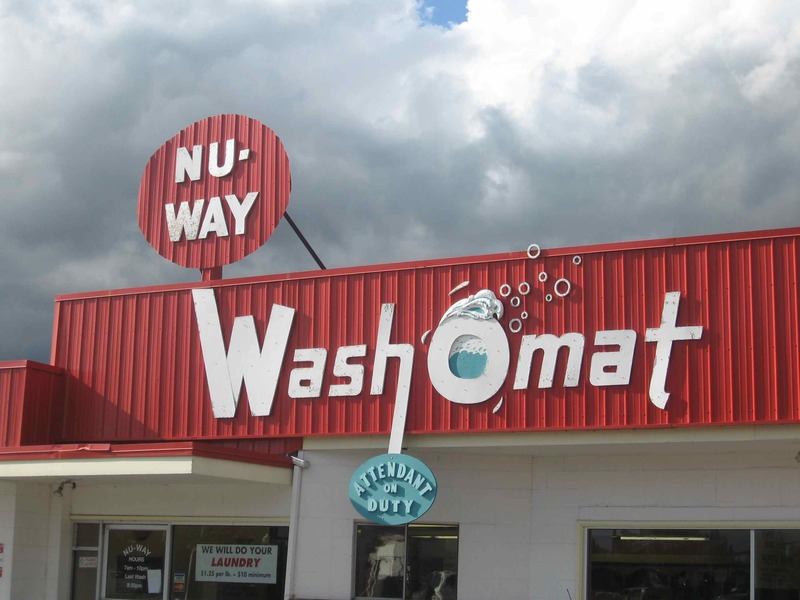 I guess this is the Pacific Northwest after all. 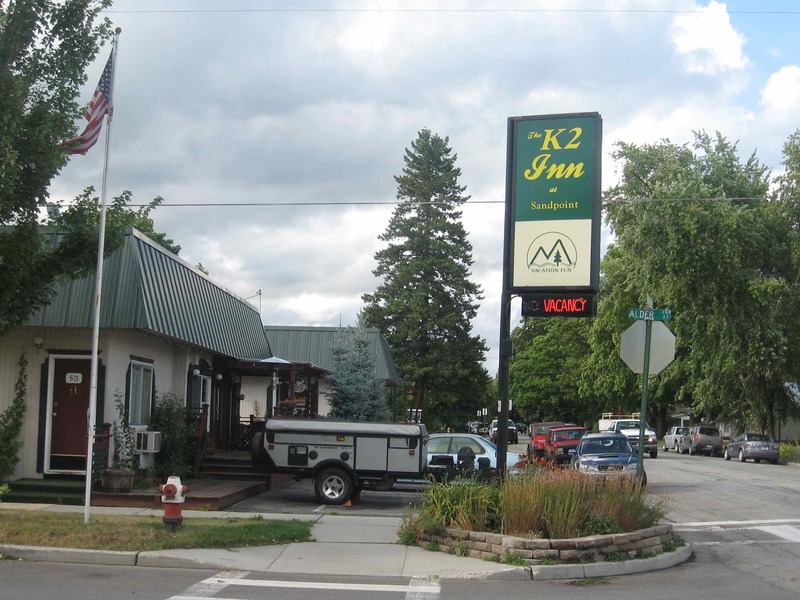 Today we did a short ride of about 15 miles to Sandpoint, followed by an afternoon in town and a night at the K2 Inn, a fine budget motel. The ride was not easy. The rain continued as we pulled out of the park and intensified as we turned north onto U.S. 95, where the traffic was fast and intense. A steady stream of logging trucks, SUVs, and semis roared past us at 60 to 70 miles an hour, blowing spray and scaring the hell out of me. I tried to concentrate on survival, staying at the extreme far end of the shoulder of the pavement and watching for rocks, bolts, and glass. After about four miles of this, we were saved by a bike path. 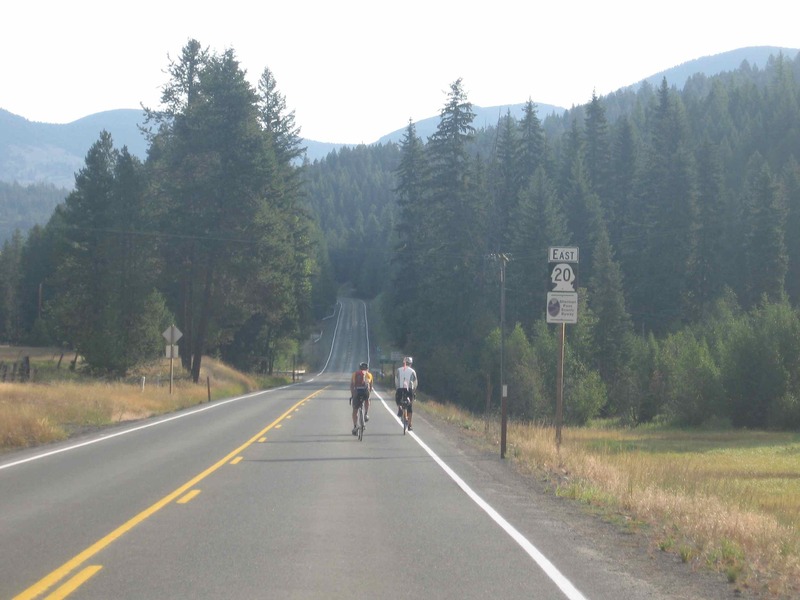 North Idaho Bikeways started building bike paths in Bonner County, ID ten years ago. They have now completed ten miles of bike paths that are separated from the road, including a stretch along US 95 that seemed like a lifesaver to us. Thanks! Sandpoint, the birthplace of Sarah Palin, is an upscale resort town surrounded by a traffic-clogged retail center. 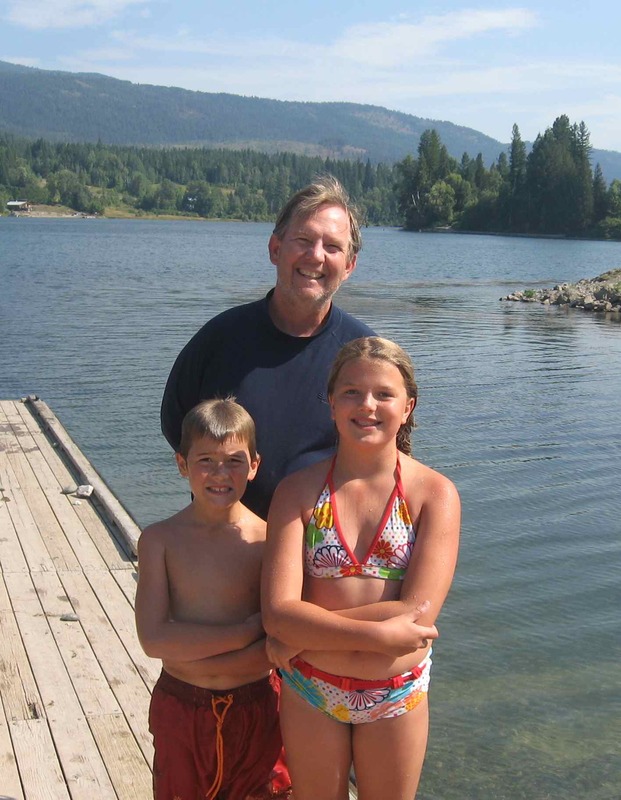 It is on the shores of Pend Oreille Lake, a glacial monster that is 1,800 feet deep with 250 miles of shoreline. It’s a beautiful lake, but I was soaked and in no mood to enjoy it right away. We checked into the K2 (that’s the Kersting camper in the foreground of the photo), and we each started a checklists of the things we needed to do before we hit the road again tomorrow. Bill’s was bike repair, ultimately successful; Jim, Sara, and Catherine enjoyed the town. I wanted to get a massage, and by luck I found an outstanding therapist, Suzanne Guibert. Jim, Sara, Bill, and Catherine went out on the town, but I stayed behind to do laundry. 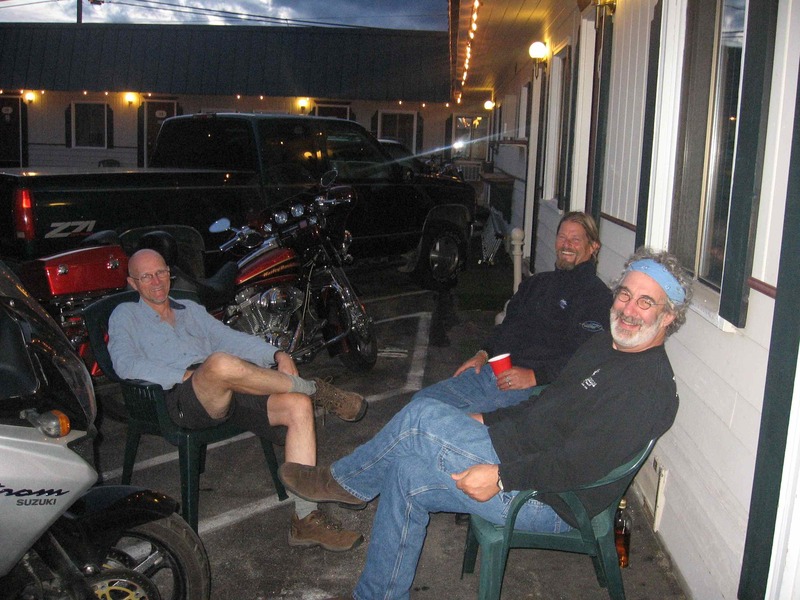 Then I had a drink with Mike and Ed, two guys on Harleys in the room next door; and, amazingly, Kevin Bradbury, a state park manager from Portsmouth, Ohio who rode in on a Surly Long-Haul Trucker with full panniers at dusk and is on the same route we are (l-r in the photo: Kevin, Ed, Mike). Ed said in a matter-of-fact way that he used to ride competitively for Schwinn and has ridden across the US with an average speed of 22 MPH while pedaling. We’re averaging about 12. Ed said he would take in 10 to 12,000 calories a day on the ride and sleep one hour a night. He would hang out with people who could ride across the U.S. in a little more than a week. We’re taking two and a half months. But he seemed impressed anyway, or at least interested. He has a really nice Harley now. Thanks for the Bushmills, Mike! Our travel companion on Day 10 was Kevin Bradbury, 53, whom we met at the K2 Motel last night. 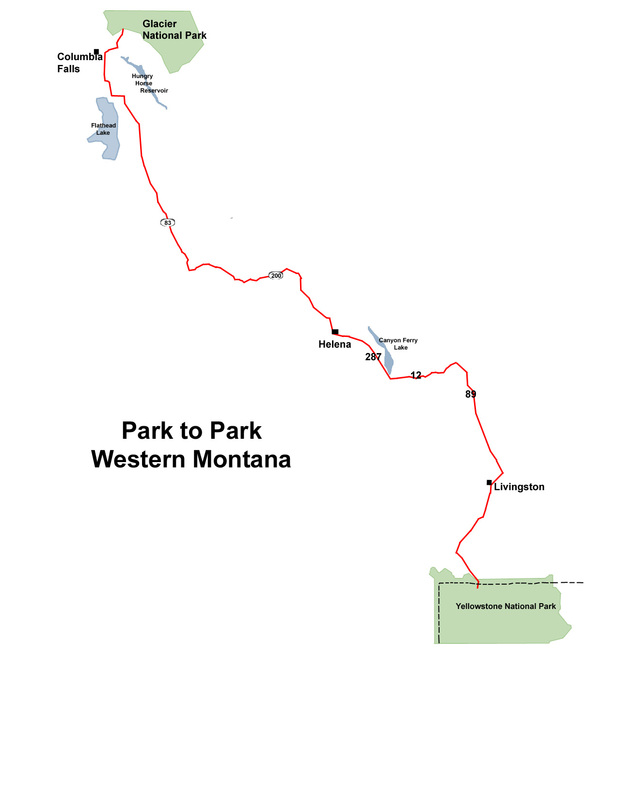 Kevin shared our route as far as Glacier Park, and he was on his way to visit a friend in Libby. He traveled alone on a fully loaded Surly Long-Haul Trucker, and his kit was tight: front and rear panniers that roll up like dry-bags, a tent and sleeping bag on top of the rear rack, a large handlebar bag, and a tent pole lashed to the front fork with a big rear-view mirror on one side. The bike weighed about 70 pounds loaded and was hard to pick up. Kevin was a man of few words. He was also intelligent, witty, and unfailingly polite. He was a constant reminder that Jim, Bill and I were, in fact, wimps on a luxury bike tour. Kevin is a regional manager for the state parks in southern Ohio. He lives near the town of Portsmouth on the Ohio River, and to train for the ride he would ride his bike from his farm to the office 20 miles away, and then on to the parks he manages. On Day 10 we rode along the north shore of Lake Pend Oreille and then continued along the Clark Fork River, which drains into the Lake. The weather was cool and gray, with an 80 percent chance of rain as we started out at 8am. 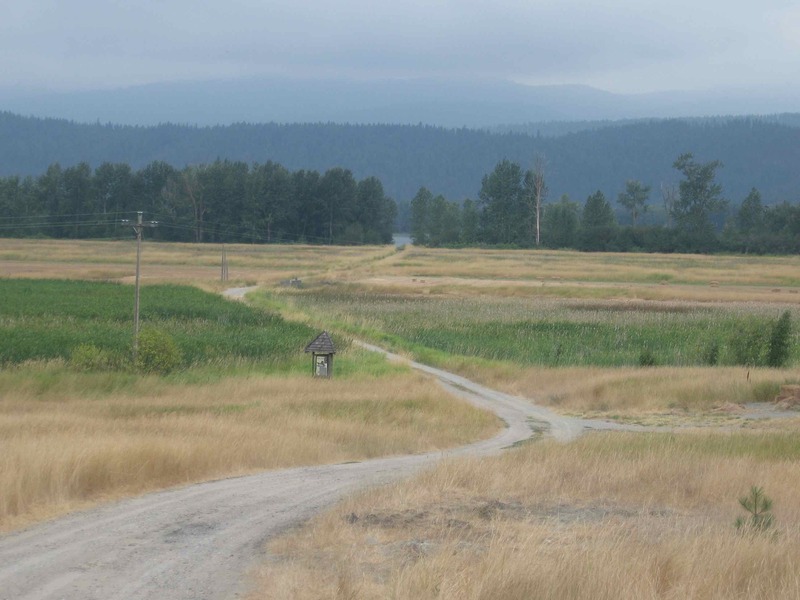 Soon we were past Sandpoint and in the Pack River Delta, an old fishing ground for the Kootenai Indians. The roadside panel explained that there are still bear, otter, moose, bobcat, and coyote here. There are also huckleberries. Huckleberries taste similar to blueberries, but they’re smaller and the taste is subtly different. On the roadsides we have seen serviceberries, chokecherries, wild grapes, and marionberries (which are like Oregon blackberries), but so far we have not seen huckleberries in the wild. 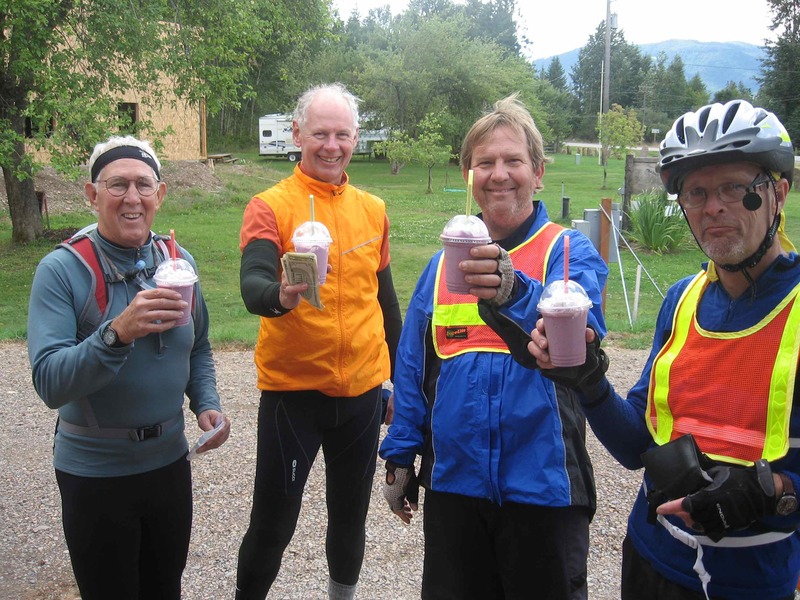 We have, however, tasted huckleberry milkshakes, which are a regional specialty. We had our first at the Brew Hut, a mobile drink stand outside of Clark Fork. We would have one each day for the next two days, too. Jim and Bill and I don’t know much about identifying plants, but Kevin did, and as he made informed comments we tried not to reveal our ignorance. 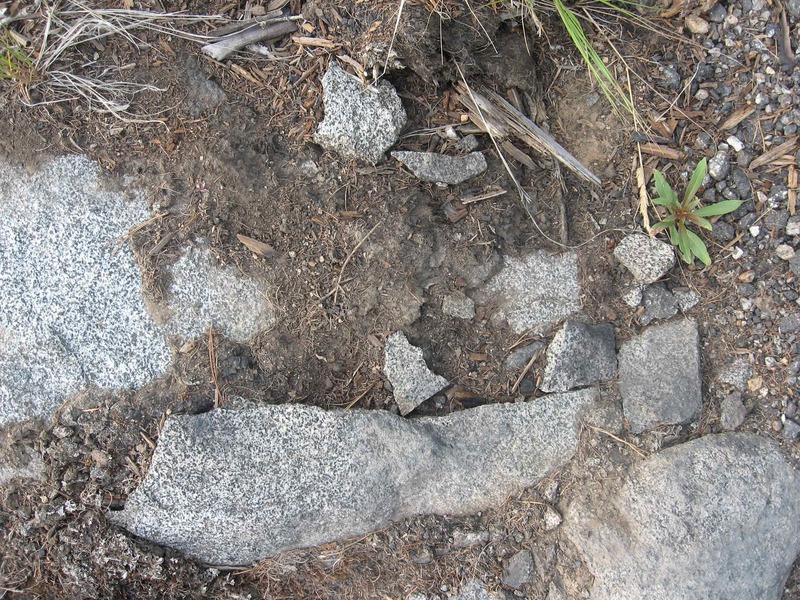 Another roadside panel near the mouth of the Clark Fork explained that we were near the site of the bursting of Lake Missoula, a glacial pool that covered an area the size of a small northeastern state 15,000 years ago. Geologists have reckoned that the lake was held back by an ice dam perhaps 2,000 feet high until one day, near the end of the last ice age, it burst and all that water rushed through eastern Washington, the Columbia River basin, and into Puget Sound, wreaking havoc on an unimaginable scale. The best account of this flood I have read is in John McPhee’s epic on American geology, Annals of the Former World. There is also a not-for profit group called the Ice Age Floods Institute that saves important sites and interprets these events for the public. 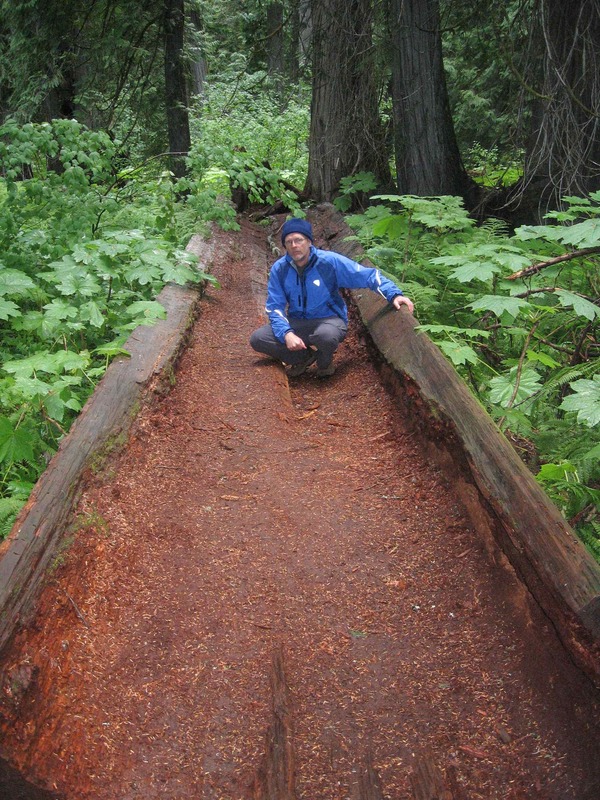 They are lobbying the National Parks Service to designate an Ice Age Floods National Geologic Trail. Between the towns of Hope and East Hope we passed a stone obelisk marking the site of Kullyspell House, the first trading post in Idaho. It was established in September 1809 by two of Canada’s greatest explorers, David Thompson and Finnian MacDonald. They came for fur, but their impact on western Indians was about as catastrophic as the bursting of Lake Missoula. Europeans brought smallpox, syphilis, alcohol, and other plagues that wiped out most of the Indian population in the west before a single shot was fired. But we didn’t get them all. Now a new generation of college-trained Indians are among the leaders in a movement to restore native species in the Northwest. We rode a beautiful ranch road along the south side of the valley of the Clark Fork, and at some point we entered Montana. There are usually no welcome signs when couty roads cross state lines, but there were a lot more potholes on the Montana side, and also a lot more highway fatality roadside markers. 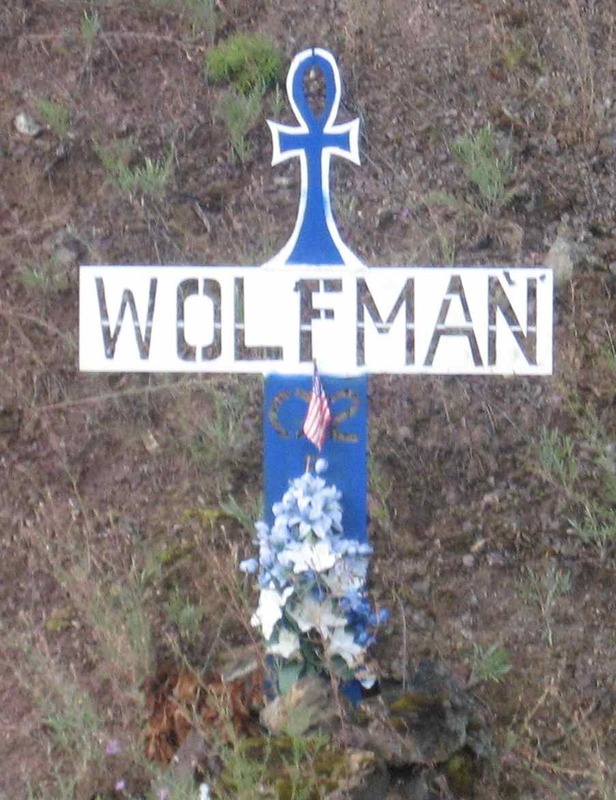 The American Legion in Montana puts white crosses at the site of each fatal crash, and there are a LOT of them. Maybe it’s because there’s no helmet law for motorcycles here; maybe it’s the lack of a speed limit in rural areas; or maybe it’s just that they have marked them all. The scenery also became grander in Montana; the mountains were higher, the grasses taller, and the Clark Fork was flowing freely. This was unusual, because most of the rivers we’ve cycled along in the Northwest are really lakes. We rode through a brief rain squall, and as the afternoon wore on the clouds became more and more threatening. We turned back onto Route 200 East and pressed on. Near the town of Heron, the skies opened up. We took refuge under the awning of a grocery store operated by smiling, chubby women wearing old-fashioned bonnets. People in plain dress came in and out as we stood there eating the pecan pie slices and chocolate chip cookies the women made in their bake shop. They wouldn’t tell us which religion they followed. Across the street was another grocery store with flyers on the counter. 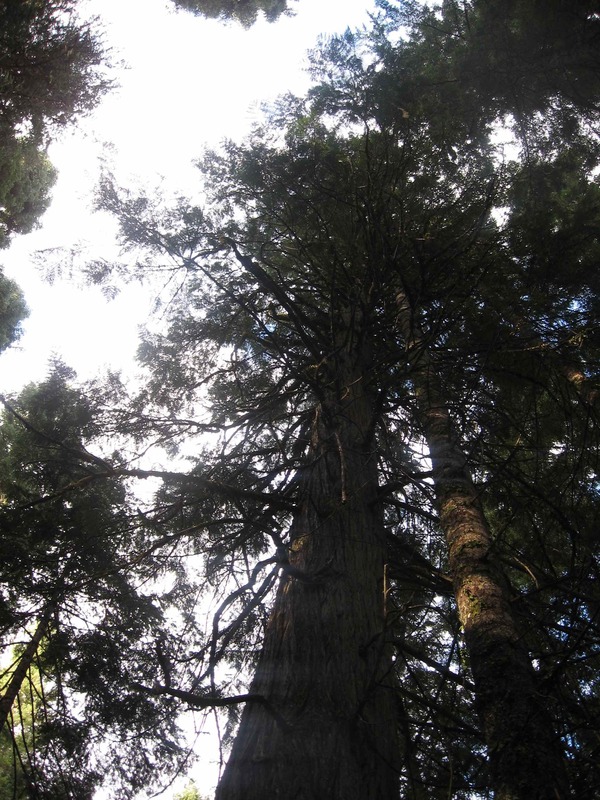 The flyers asked, “Would you like to stop tax-exempt foundation-funded special interest groups from manipulating the US Forest Service?” A Group called the Sanders Natural Resource Council was asking for support of a “coordination plan” they submitted to the County Commissioners. The general idea was less wilderness and more roads that would allow more logging and mining of federal land. The flyer cited a group called Stewards of the Range approvingly. The rain let up eventually and we turned north on Route 57, with the Cabinet Mountains Wilderness to the east, the Scotchman Peaks Wilderness to the west, and Cabinet Creek next to the road. 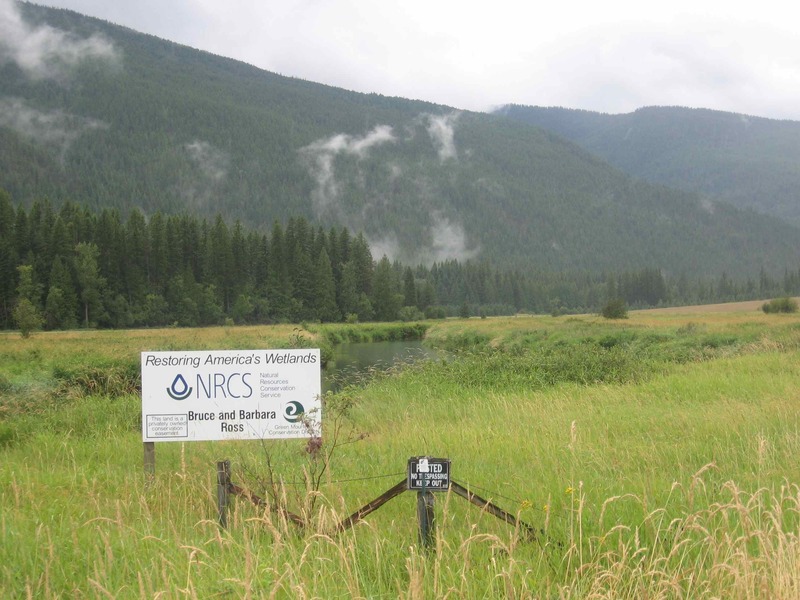 The scenery became spectacular, and in two particularly fetching spots there were billboards celebrating the completion of conservation easements held by the Natural Resources Conservation Service, an agency of the U.S. Department of Agriculture. Oooo boy! I bet the grocery store guy HATES those. Ross Creek Cedar Grove Scenic Area, an old-growth stand with trees eight feet in diameter and 175 feet tall (That’s Kevin inside the trunk of a downed cedar for scale). We put up our tents, walked down to Bull Lake for a calendar-quality sunset, and invited Kevin into the camper for a late dinner of hamburgers, fresh organic Idaho fingerling potatoes, and adult beverages. It was simple food but Sara and Katherine had prepared it perfectly, and they were serving it to men as hungry as draft horses. The camper was dry and warm and bright with loud talk and laughter. Kevin held his own as our jokes became increasingly raucous in the deepening gloom. When we said goodnight and went to our sleeping places, the sky had cleared and was full of stars. When we woke up the temperature was hovering around 40. It was the opposite of a few days ago, and we lingered in camp until it was warm enough to ride. We had also crossed over into Mountain Time, so we didn’t leave until 9:30am. We put on out tights, gloves, long underwear, and jackets, and set off. Kevin hung back. We didn’t see him again, but we did trade e-mail messages as we both pedaled across the country. He made a contribution to the Land Trust, too. We continued north on Route 56, still with wilderness on either side of us, but as we rode on the peaks became lower and further away. After an hour or so we passed into private land. The highlights included a wonderfully sleazy-looking roadhouse called the Halfway House and “Majestic View Ministry,” which looked like a majestic tax dodge. The cell phone came alive just south of US Route 2, the major east-west highway in these parts. We took it and started along the Kootenai River, which flows freely at this stage. We passed Kootenai Falls, where an endangered species of sturgeon still spawns, thanks to a hatchery operated by the Kootenai Tribe of Indians. Route 2 had a lot of traffic but a wide shoulder, and the sun was strong enough to let us strip down to shorts and t-shirts. 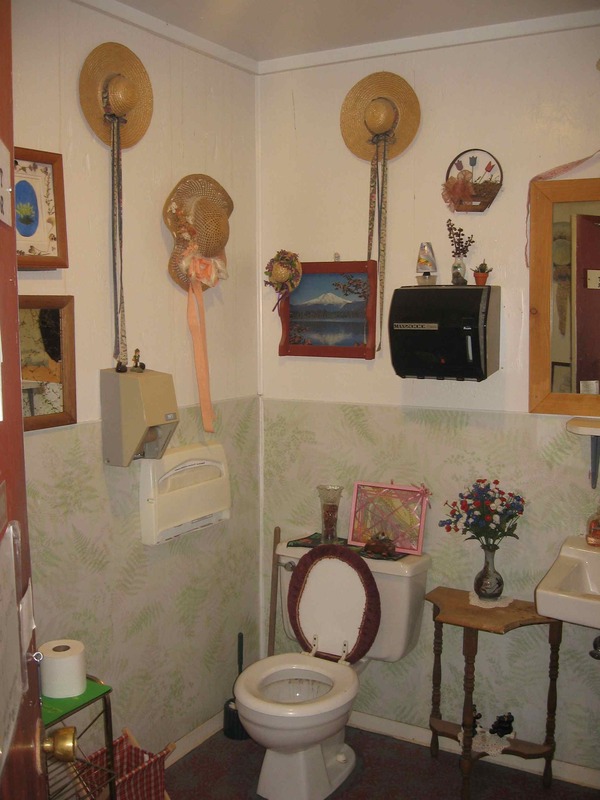 We went into Libby, a rough-looking place with a spectacular diner: Henry’s Restaurant, next to the Ace Hardware Store. We got there as the lunch crowd was thinning out. I ordered a patty melt with fries and clam chowder, and coffee, and was stunned when it was set before me. It wasn’t just the furnace-like hunger one develops on these rides; this was excellent food. The patty melt was grilled onions, melted cheese, and a thin beef patty on a thick slice of fresh rye bread grilled perfectly. The fries were hand-cut, the chowder homemade. As we were chowing down, a friendly woman who was maybe 60 went to a three-spindle Hamilton Beach milkshake machine and started making our dessert: huckleberry milkshakes. 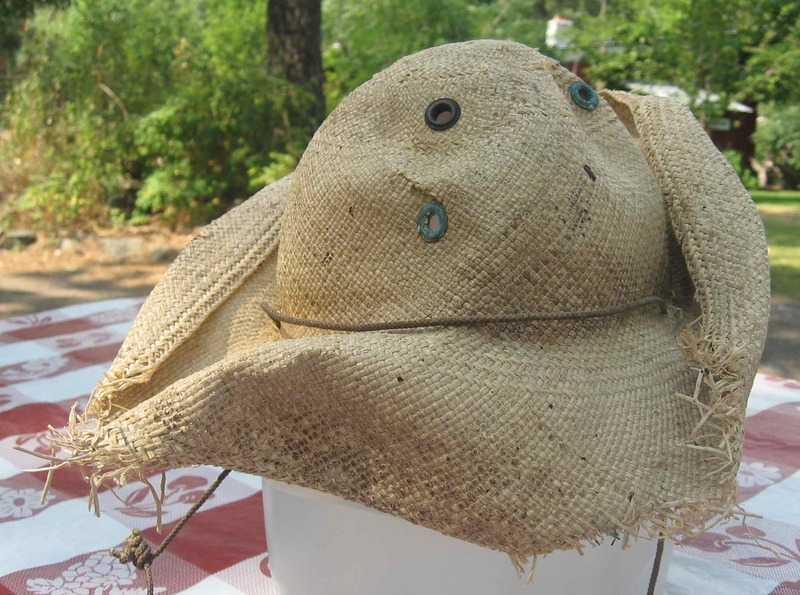 She peeked over the top of the steel cups as the mixer whirred, added a little milk from a cup, and threw a handful of fresh huckleberries into each steel cup. Then she served it to Jim and I in the steel cups. “It was a grade-a shake,” said Jim, who knows about such things. “The fruit was fresh, the ice cream was thick. And the consistency was perfect. I tilted my head back and oh, how the last few drops just rolled in.” I agree. I would have to rate this among the top three milkshakes of my life so far. There was so much that we gave our excess to Bill, who acted nonchalant. But we knew he wanted some. 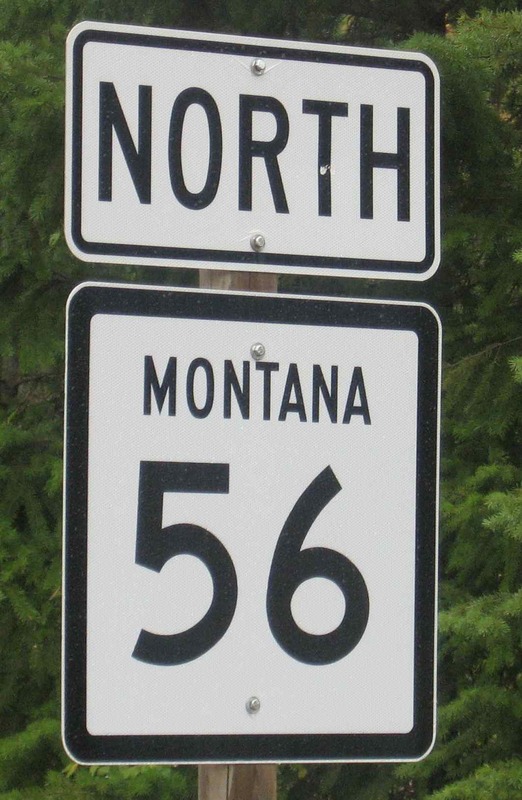 Stuffed to the gills, we turned north and headed up Montana Route 57, along the Kootenai again but with less traffic. The river was still flowing with clear greenish water deep enough to float the local style of fishing boat, which looks like a dory. Ospreys were tootling and wheeling from hacking platforms. A stream of freight trains groaned past us on the opposite bank, first headed north, then south. The temperature was perfect. Then we took a left on US Forest Service Road 228, which goes up to Libby Dam and then along half of the 90-mile lake it created, Koocanusa. 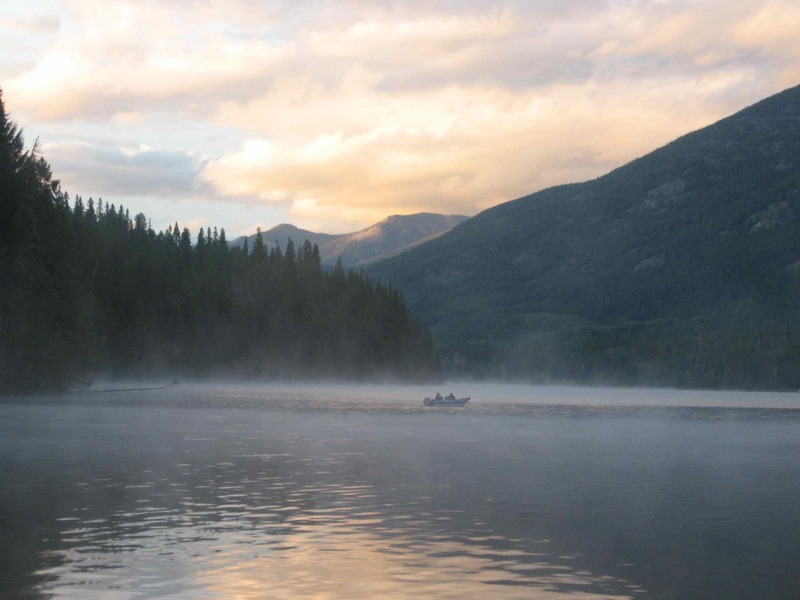 Koocanusa is not an Indian name; it is a conflation of Kootenai, Canada, and USA. The lake is so long that half of it is in Canada. 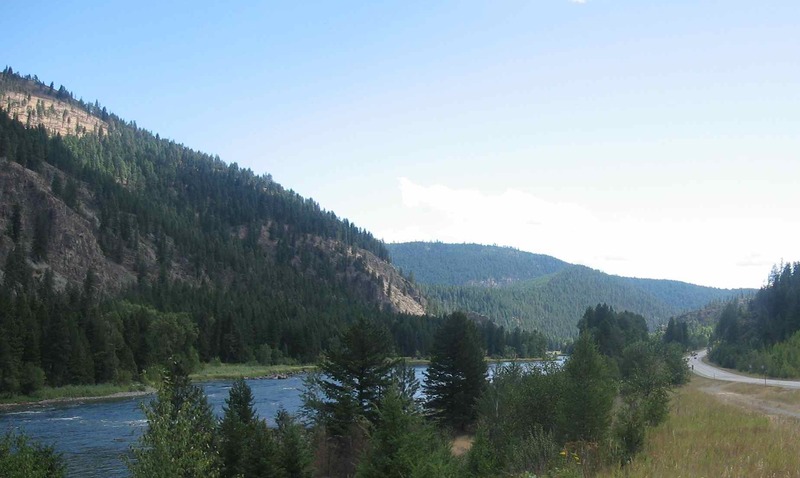 The Kootenai River rises in British Columbia, flows into Montana and Idaho, then turns north again and enters the Columbia river back in Canada. Libby Dam is a huge mass of concrete, hundreds of feet high and half a mile long. If you look closely at the photo, you can see a boat in the river that will give you a sense of scale. It is one of the last large federal dam projects in the West, and was completed in the early 1970s. The Columbia River Treaty governs its operation. 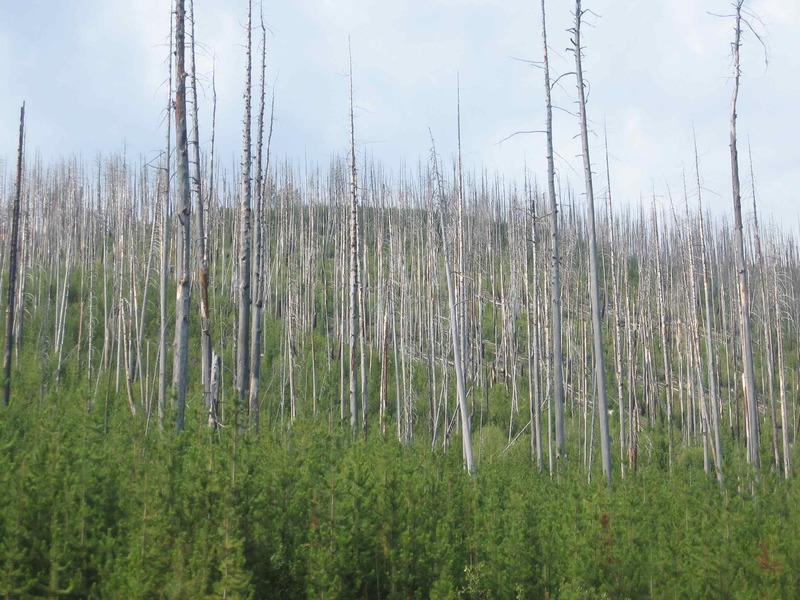 At the palatial visitor’s center, we had a long conversation with a park ranger who described how carefully the Forest Service and other agencies, including the Kootenai are working to protect native species of fish downstream. The more I heard, though, the more I saw a huge federal boondoggle. The visitor center has a huge exhibit, an there is also an overlook, a campground, and a park at the base. We were the only people there. 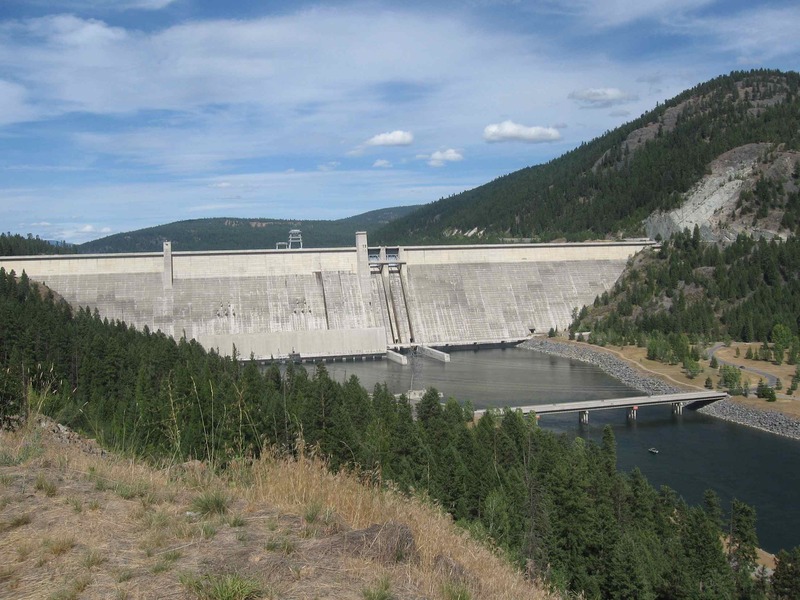 The dam was built to provide clean electricity during times of peak demand, such as summer afternoons, but the large releases of water needed to generate that much power messed up the ecosystem so much that its original purpose proved illegal. So the dam doesn’t even serve its primary purpose. It does help people downstream avoid floods, but there really aren’t that many people downstream, and as farming goes it ain’t the San Joaquin Valley. I wondered: couldn’t you give each resident of Bonners Ferry, Idaho enough money to relocate, and still spend less than it cost to build this dam? We biked up a beautiful paved road that had no traffic and went through Federal land with no private inholdings. There was a good highway on the other side. I later learned that the road we were on was built to carry heavy equipment up the lake. The original highway was submerged by the dam, and after the lake was completed a new highway 37 was built on the opposite side. How much did that cost? We stayed at a nice U.S. Forest Service campground 10 miles up the road that had signs pointing to a beach. When we got to the beach, we found a large stone bath house, lifeguard stands, an ampitheater, an expanse of sand, and no water. The lake level was too low. But after two days Jim and I smelled like spoiled beef soup, so we picked through the rocks and dove in. The bottom was mud, and thick clouds of silt rose around me as I paddled into deeper water. Libby Dam went up in the early 1970s, and the Endangered Species Act passed in 1973. A lot of people in the rural west hate the Endangered Species Act. I can understand why. Nobody likes to be told that the party’s over. It was cold again in the morning but we were riding by 9am. 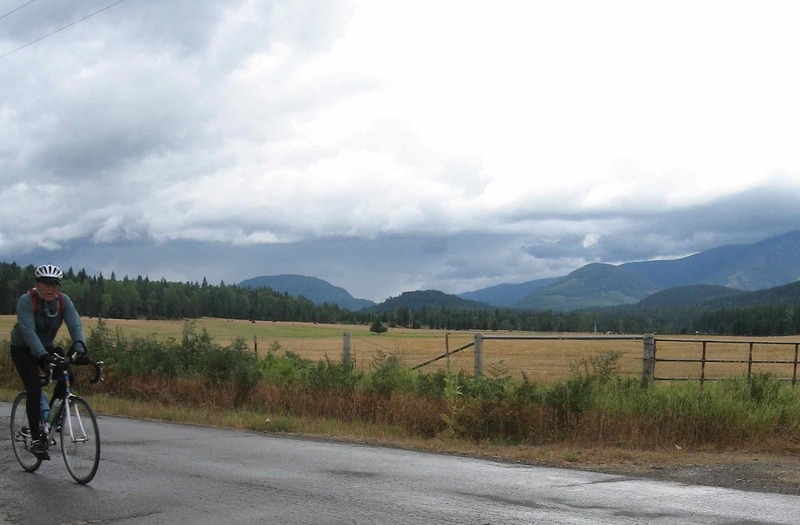 We continued on the Forest Service road bordering Lake Koocanusa for 30 miles until we finally got to the one bridge that connects to Route 37; then we got back on 37 and headed north to Rexford and east to Eureka, our destination for the night. The Forest Service Road was so beautiful that it became monotonous. It was almost a bike trail. In the three hours we spent on it, we saw three cars, three motorcycles, and six other bicycles. We also saw ospreys, deer, heron, and red-tailed hawks. We’re still looking for huckleberries and bald eagles. 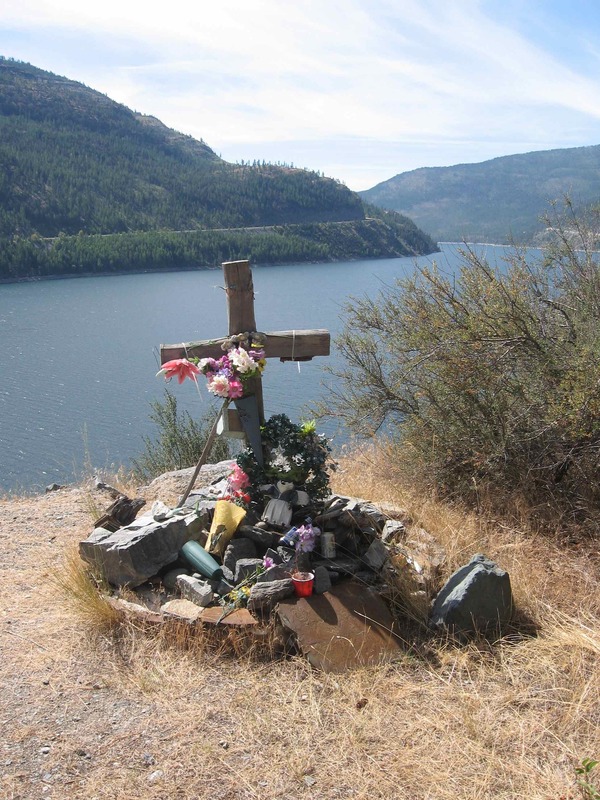 Just before the bridge there was an elaborate roadside memorial for Bob, Tom, and Jim, who apparently missed a turn, sailed off a high cliff, and crashed into the lake on April 27, 1997. Eek. 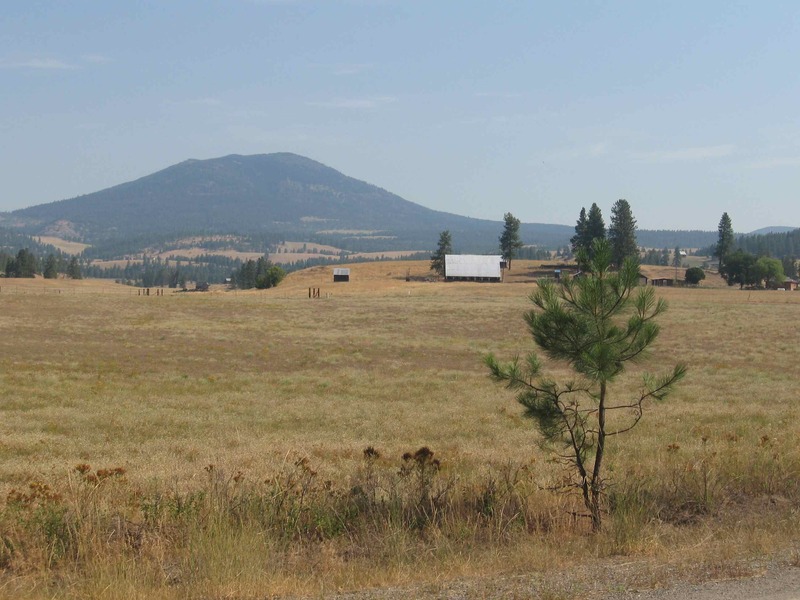 As soon as Route 37 rose out of the Kootenai Valley, the landscape changed dramatically. 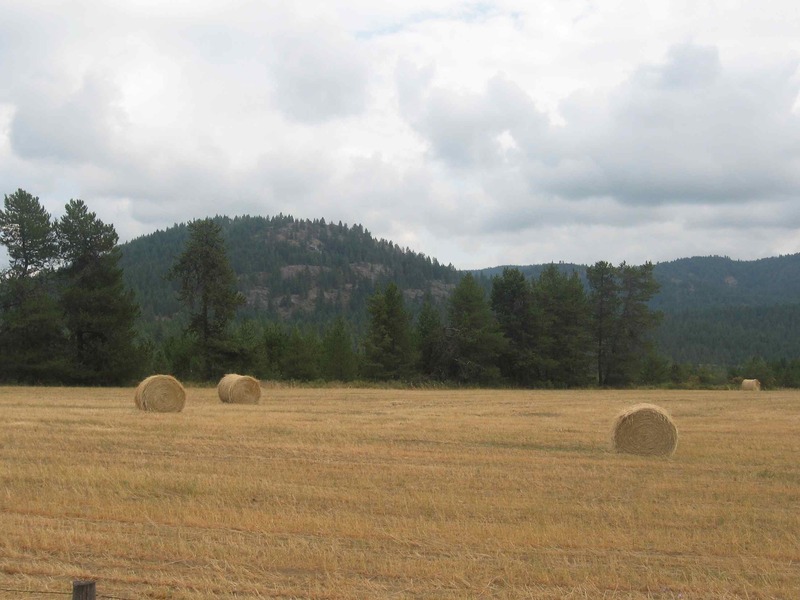 Where there had been cedars and ferns and lots of water, now there were high peaks covered with Ponderosa pines, enormous meadows, and long rolling hills. All of a sudden it looked like the Rocky Mountains. We entered the Tobacco River valley, named for the crop grown by Indians for trade to whites in the 19th century. 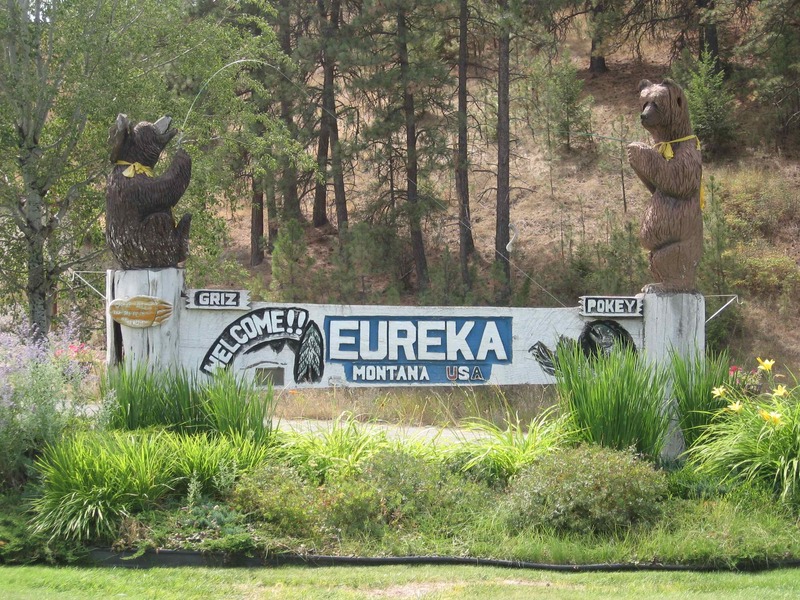 We hit U.S. 93 just outside Eureka, an appealing town of about 1,000 people. We made it to a clean, tiny municipal campsite there by 2pm and found several free wireless internet spots. I took a break from writing to join the crew for a surprisingly upscale dinner at Jax Café, which has a good wine list and a fine dinner chef. It also serves huckleberry milkshakes, but by the time we finished our fancy pastas and salmons and salads and loads of foccacia, we were all too stuffed. Tomorrow our destination is Glacier National Park, and Monday is a rest day.